The R-PLEX Human Galectin-3 Antibody Set includes a matched capture and detection antibody pair and calibrator for the quick and easy measurement of Galectin-3 in biological samples. R-PLEX products leverage MSD’s electrochemiluminescence technology for better sensitivity and a larger dynamic range than traditional ELISAs. R-PLEX matched antibody sets enable the development of singleplex and multiplex immunoassays. Individual assays may be developed using MSD avidin- or streptavidin-coated plates. Custom multiplex assays with any combination of R-PLEX analytes, as well as R-PLEX and U-PLEX analytes, can be developed on U-PLEX MULTI-SPOT plates. To learn more about the advantages of R-PLEX products click here. 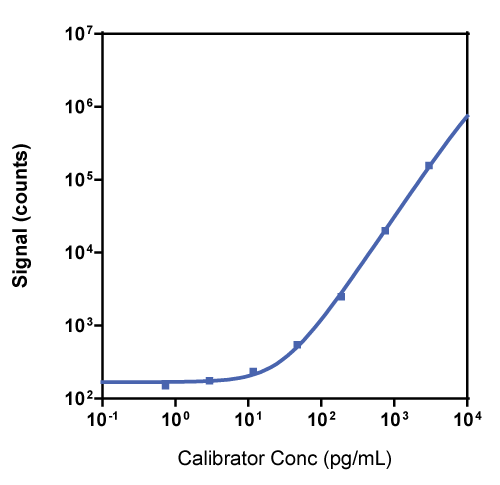 Calibration curve for the R-PLEX Human Galectin-3 Antibody Set was assessed and representative data is presented below. Description - Galectin-3 (Gal-3, LGALS3, LEG3, AGE-R3, CBP35, galactose-specific lectin) has many intracellular and extracellular functions. These functions include cell-cell adhesion, angiogenesis, metastasis, and apoptosis. Galectin-3 expression in the heart is significantly upregulated as heart disease progresses. It also has multiple implications in cancer progression and metastases. Galectin-3 is associated with many fibrotic diseases such as liver fibrosis, where its expression is elevated. Note: It is recommended that the Galectin-3 Antibody Set only be run on U-PLEX Assay plates, and not on plates coated with streptavidin. For singleplex Galectin-3 assays, order the appropriate size and number of U-PLEX Development Packs, 2-Assay, and add them to your cart. Development Packs include MSD GOLD Read Buffer; therefore you do not need to add it here.